A donut wall may be just what you need at your next party! Taking sweets to a whole new level, The Candy Buffet Company is proud to present the donut wall (or should it be doughnut wall?). The Candy Buffet Company is a leader in the Australian dessert catering industry. Each and every client we work with is unique and that’s how we want to design our desserts. We make sweets look beautiful, and a donut wall is no exception. A display of sugary, doughy goodness, donut walls can be classy or fun. Dress them up with fresh floral or add a banner to create an element of fun. Either way, they’re the perfect compliment to your candy buffet, and can be designed to match your theme. 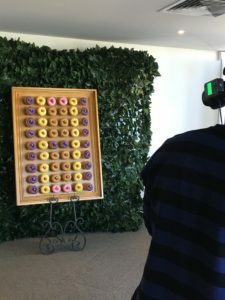 A donut wall in Australia is the latest party trend. Of course, a donut wall can be suit all types of events. 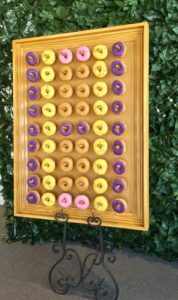 Weddings, engagement parties, birthday parties & corporate events can benefit from a donut wall display. Some brides are even replacing the traditional wedding cake with a donut cake. It’s a great corporate party idea, giving a new life to corporate celebrations. Best of all, The Candy Buffet Company has everything in stock, ready to create the perfect display. 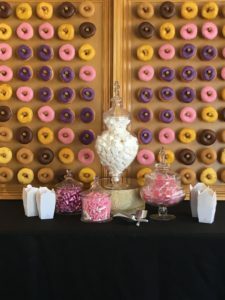 We’ve also created a donut table (also known as a donut buffet) using our gorgeous apothecary glassware. Our risers can be customised to match your theme, giving an element of height to your dessert table. So, however you like your donuts displayed, we’re in! Our stylists incorporate the style, theme and colours of your event in the display. This transforms a plain wall into a decorative masterpiece. Our graphic artist is standing by to personalise your donut bags. This creates a “special” feel to your event. Incorporate a chocolate fountain and your guests will love choosing their favourite donut & dipping it in chocolate for that sugary high! Add a few jars filled with marshmallows, lollies or chocolates and suddenly it’s a dessert table! We can also provide a macaron tower, personalised chocolate bars, lolly bags, lolly boxes, cupcakes, biscuits or baked goods. So, don’t delay. Contact us to receive a free, no obligation quote. Have a look at our blog article about donut walls to read more. For more sweet information, visit The Donut Wall Company website.